He began his first full day in office by declaring war on the media, and now the President is circulating an "enemies list" asking "the enemy of the people" to bar his most vociferous political opponents from speaking on their airwaves. 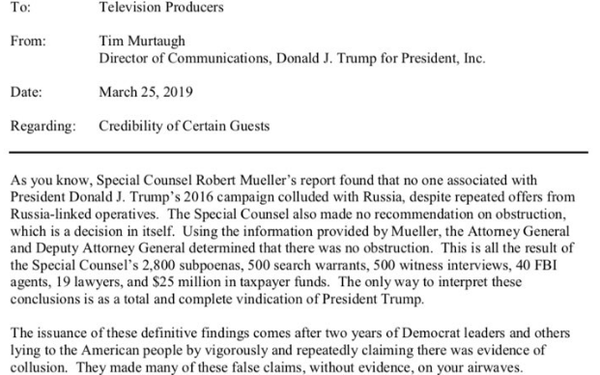 The memo cites Attorney General William Barr's initial sum-up of the Special Counsel's investigation of the President's campaign ties to Russia as proof that his enemies -- who mostly are members of Congress responsible for providing oversight of the President -- lied to the American people and that if they do appear on their news programs, the producers "should replay the prior statements and challenge them to provide the evidence which promoted them to make the wild claims in the first place." My first reaction was that this felt like it was part of a prepared campaign strategy to seize on the White House's spin that Barr's summation is the final word, and in the words of the President himself, a "complete and total exoneration," even though Barr's summary included a statement from Special Counsel Robert Mueller saying explicitly that the investigation "does not exonerate him." In other words, the President entered the post-Barr part of his term the way he began the first part: by lying. My second reaction is that the reelection campaign's request to blacklist the President's political opponents is part of a much bigger disinformation campaign that may be the envy of the counter intelligence community. Time will tell what the Special Counsel's investigation actually found, not what the President's hand-picked Attorney General asserts, but the tactics being employed by the White House and the reelection campaign are straight out of the GRU. Trump's campaign may not have actively colluded with Russia, but it's reelection campaign, at least, has studied Russia's tradecraft well, especially its use of so-called "active measures" to attack political opponents by sowing disinformation that creates division within society. What surprises me most isn't that the White House would try to spin Barr's spin, it is the brazen and outlandish way they are doing it. It's more than a war on media. It's more like a war on reality, even if the media are the conduit for it. "It's branding for him," added "Morning Joe" co-anchor Mika Brzezinski. Memo To TV News Producers: Take Ignatius' advice. Don't take the bait. 11 comments about "White House Provides Enemies List To, Well, 'The Enemy Of The People'". Douglas Ferguson from College of Charleston, March 26, 2019 at 11:27 a.m.
Maybe I'm mistaken but the media declared war on Trump well before he had his first day in office. The 675-day collusion story came up empty and the media silence is stunning. This is a giant black eye for CNN and MSNBC, but again, just my opinion. Joe Mandese from MediaPost, March 26, 2019 at 11:36 a.m.
T C from N, March 26, 2019 at 12:36 p.m.
Joe, it sounds like you took the bait. Joe Mandese from MediaPost, March 26, 2019 at 12:39 p.m.
Paula Lynn from Who Else Unlimited, March 26, 2019 at 2:55 p.m.
McCarthyism is on the rise. Individual one's close advisor, lawyer (before he dumped him when he found out he had AIDS) was Roy Cohn also of the McCarthy trials aks Blacklisting Trials. The nazis fighting communism. Here we go again as we have from the beginning of giving individual one any power. This is a death and destruction administration - every single thing they have done has caused pain and death. Check it out and it will bear fruit that their goal is indentured servitude and slavery through poverty. Would you take $2/hr if it would save your child's life because you cannot afford insurance and their medical care/medicine ? Tony Jarvis from Olympic Media Consultancy, March 26, 2019 at 5:38 p.m.
Paula: McCarthyism is surely already here and well established under the leadership of the "vile" (Steve Schmidt - former Republican) "moron" (Rex Tillerson- former Secreatary of State) who I suggested was the "new Mussolini" in a Media Post comment as American Nationalism (as opposed to Patriotism - so significantly different) was being reignited during 2016. Hopefully Mr. Ferguson will be severly taken to task by his students for sloughing off CNN & MSNBC's generally accurate reporting of the consistent and continual embarassing and often reprehensible behaviour of the current occupant of the Oval Office? Perhaps those students that have not been given an "A" in his classes should simply claim "fake"! Those that are now hiding behind the Mueller Report to give the current administration, including all those that have pleaded guilty or have been convicted, a pass on their frequent corrupt, egregious and unconstitutional behaviour as accurately reported by the quality media merely exacerbate the damage already done to a country that is becoming a pariah around the Globe. With the exception of those run by ruthless autocrats of course: Russia, North Korea, Turkey, etc. Todd Gaak from Observer, March 27, 2019 at 11:40 a.m.
Well, the great unwashed have and will continue to vote with their feet, eyeballs, and pocketbooks. The press has no one to blame but themselves. But I guess "being an elite means never having to say you're sorry." Joe Mandese from MediaPost, March 27, 2019 at 12:04 p.m.
@Todd Gaak: I don't think "the press" expected Trump to be anything different than he has proven to be all along. By their "involvement," do you mean exercising their Constitutional right to cover our government? Re. public opinions of the press, you must be listening to the opinion of a certain POTUS. Legitimate research shows that is a mixed bag, but what's really happening is that the public has so many more media options to choose from, including biased or less-than-trustworthy ones. (See Ipsos and Knight Foundation studies). In fact, a media trust tracker we've been conducting with Brand Keys shows that generally speaking people are more trusting of mainstream or left-leaning media than right-wing media outlets. Anyway, the real point of this blog post was that the White House is spinning Barr's letter and summary as "exoneration," even though the only thing we know from Mueller so far is that he did "not exonerate" the President. And the fact that they have begun circulating an enemy's list and pressuring news outlets to blacklist the President's political opponents. In other words, Banana Republic-level autocracy. Joe Mandese from MediaPost, March 27, 2019 at 12:11 p.m.
Paula Lynn from Who Else Unlimited replied, March 27, 2019 at 8:21 p.m. True. I tried to pose in such a way because I would bet 90% of our citizens including readers of this column do not know history. BTW: Mr. Barr's son in law has been very recently added to the White HOuse counsel. Paula Lynn from Who Else Unlimited replied, March 27, 2019 at 8:29 p.m.
Barr also had a choice about when his 4 page propaganda would be released. He could have said next week, etc. It took him 2 days to read through the entire report and notes from this 22 month report from so many people and then could make determinations ? Hogwash.